BEIJING – Zuo Ping bitterly regrets not seeing more of his parents during the last years of their lives so when he returned to China after two decades in the United States he was determined to set up a business helping the elderly. “Caring for the old is important but there are not many businesses engaged in it in China so I decided to look for an opportunity to do so,” said the former equity management company owner. According to the Ministry of Civil Affairs, there were about 167 million over the age of 60 in China at the end of 2009 – 12.5 percent of the entire population. Analysts say the number of people older than 60 is increasing by 3 percent a year, reaching a total of 450 million by 2050. Zuo, who is in his 50s, has managed an accommodation block for the elderly for two years since 2009 in Beihai, Guangxi Zhuang autonomous region, where the climate is similar to California’s balmy weather. Unlike traditional Chinese nursing homes, Zuo’s business puts special focus on the needs of his residents by providing a room in which they can chat, entertainment centers and a gymnasium. “The people who come here are thinking ahead. They realize that it is a more healthy option,” he said. Zuo added that many of the retirees come from big cities and are willing to pay for the privilege but are nonetheless initially wary because they harbor suspicions about China’s healthcare system. Zuo said he rented a traditional nursing home and spent several million yuan on refurbishing it. He charges between 1,000 ($152) and 1,300 yuan a month inclusive of food and lodging. According to Money Weekly, a Shanghai-based financial magazine, nursing homes in Beijing and Shanghai generally charge from 1,000 yuan to 2,000 yuan a month, depending on the level of service. Higher-end ones can cost 5,000 yuan a month or more. “The first two years were difficult but now I have begun to make a profit,” said Zuo. According to the businessman, few overseas enterprises have invested in China’s vast market for care of the elderly. He is encouraging them to bring products, equipment and management skills to it. Masayuki Fujita, chief executive officer at Japan Frontier Age, a major non-profit organization that specializes in the needs of older people, said he was leading a group of Japanese enterprises to study the Chinese market. He believes there are opportunities and the delegation plans to bring their products and services to China. Masayuki said Japan experienced a baby boom after World War II and has been developing strategies to cope with an aging population since the 1980s. He said the country encountered many difficulties that China could learn from. Zuo said policies in China relating to the elderly and funding were not perfect but he and others like him were taking innovative measures to deal with the growing number of old folk that were proving to be successful. Chai Xiaowu, an economics professor at Zhejiang University, is acting as a planner in the construction of large-scale accommodation for geriatrics in the estuary city of Jiande, Zhejiang province. So far there are 15 nursing homes and 1,441 beds. “In the nursing homes, at least 60 percent of the population is made up of old people. High-quality facilities will be built for the elderly including matrimonial agencies and hospitals,” said Chai. The professor said large cities such as Hangzhou and Shanghai are too crowded for efficient care of many elderly but Jiande’s nursing homes can receive them. He added that in Jiande, many more good quality nursing homes will be built in beautiful suburbs that enjoy a pleasant climate so it would be like being on an extended vacation for the residents. According to Chai, 10 entrepreneurs have shown an interest in investing in the Jiande concept. Each nursing home will cost more than 1 billion yuan and will contain 3,000 to 5,000 beds. Lai Donghong, director at Dongshan Nursing Homes in Guangdong province, told China Daily that his 450 beds were full so he is arranging the construction of another building with more accommodation on land the company owns. The first building was built by the government but the enterprise is privately managed. According to Lai, State-run nursing homes have strong financial backing, but companies such as hers also receive some support from the government although the prices they charge are capped. Over the past 20 years, they received just 2 million yuan in total. The price of their best room is 2,400 yuan a month, including meals and care, far lower than most private home care centers. “The building work requires lots of money and the subsidy is not enough so we have to use our income for investment, but it has helped us expand,” Lai said. The nursing home originally had 45 beds but now has 450. More will be added. A Harbin-based committee on aging, set up by the China National Working Committee on Aging and the Ministry of Civil Affairs, has issued regulations on the management of small-scale nursing homes so that uniform standards can be maintained. Harbin, the capital city of Northeast China’s Heilongjiang province, is a pioneer in formulating such kinds of regulations in China. The committee said that the city has 1.2 million elderly people including 170,000 disabled ones. Only about 200 institutions are registered with many others operating illegally. The new regulations dictate that institutions with fewer than 20 beds should be subject to standardized management practices. All illegal ones will be closed by the end of this year, the ministry said. Yan Qingchun, vice-president at the government-run China National Working Committee on Aging, told China Daily that it is planning to step up the development of nursing homes across the country. 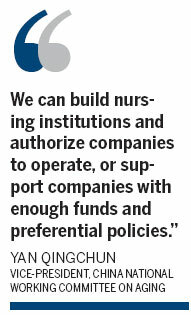 “We can build nursing institutions and authorize companies to operate, or support companies with enough funds and preferential policies,” Yan said. Yan said the Chinese government now welcomes overseas companies to invest in Chinese geriatric care. It will offer the same policy treatment to both overseas and domestic businesses. This entry was posted in Aging China, Aging dempgrahy, Elder Homes, Filial Piety, Long Term Care, Pension and Retirement reform, Retirement home industry and tagged Aging Demography, elder homes, Filial piety, high end facilities, institutional care, long term care, pension reform, population aging in China, retirement home market. Bookmark the permalink.